Prominent & Leading Exporter from Ambala, we offer ultra violet sterilizers (instrument), mechanical effect equipment, direct vision spectroscope with wave-length scale and wooden box for mercury vapour lamp. Introducing Ultraviolet Instrument Sterilizer, a product manufactured using state of the art technology for sterilizing various small & expensive instruments, within the sterilization chamber. An ultraviolet ray is a band of light with short wavelengths from 2000 to 2950 angstrom units which possesses the greatest germicidal effects of all ultraviolet wavelengths, particularly, the wavelength of 2537 angstrom units. 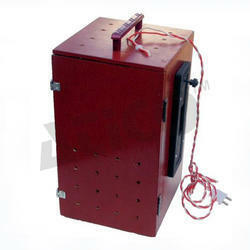 It is extensively used to destroy bacteria, virus, mould spores etc. Ultraviolet Instrument Sterilizer can be kept on even during the operations as special measures are taken to save against direct radiation. This unit can be kept on the table or at a suitable place. Advanced Technocracy Inc. is Manufacturer, Exporter & Supplier of Mechanical Effect. Cathode Rays exert a pushing effect on objects it falls on, is shown by the rotating vanes by the force extended by cathode rays. A compact visible spectrometer which allows the direct reading of spectral length and employs a prism for dispersion. 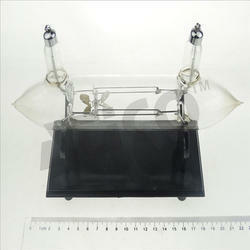 It is also useful for flame test of basic radicals (sodium, strontium, potassium, copper etc.) There is a single eyepiece and independent focussing tube for the graticule, which carries an index at 590mm, with D' marked right below the scale, (corresponding to the wave length of sodium light) can be calibrated to a known light source by adjustment of knurled screw. The amount of light admitted to the spectroscope can be regulated by a variable slit, adjusted by a knurled ring round the rating tube. 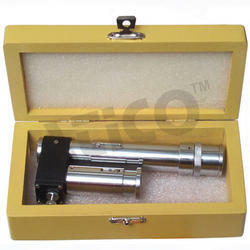 Its size is slightly smaller than the size of wooden box for sodium vapour lamp. Looking for Air and Instrument ?